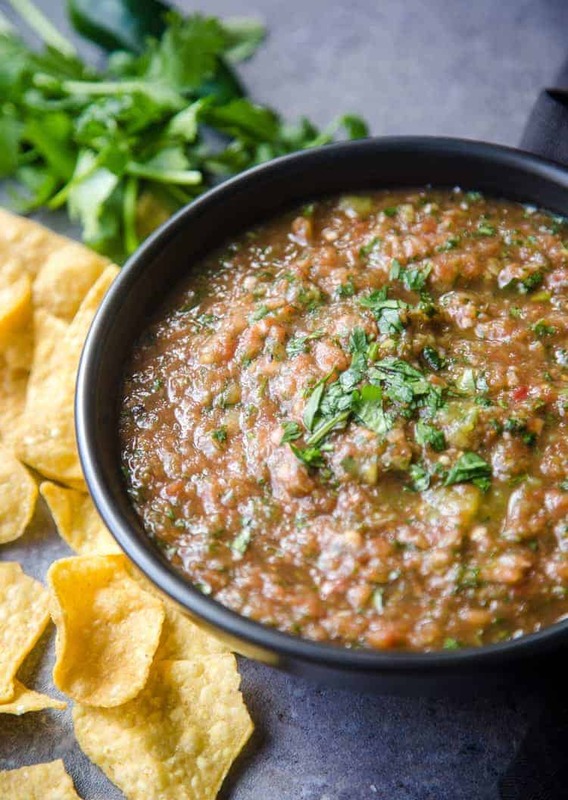 This Easy Blender Salsa is probably the best salsa you’ll ever make. It’s incredibly delicious (and addictive) and perfect for quick and easy weeknight dinners or parties! The best part is it comes together in less than 5 minutes! Today is my mom’s birthday. Happy Birthday Mom!! My mom’s cooking has inspired several posts here on the blog; including her Green Chili Turkey (my favorite ever! ), her Basic Red Chili Sauce (perfect for enchiladas like these), several other of her salsas, and many more. My mom loves cooking and sharing her love for people through food. 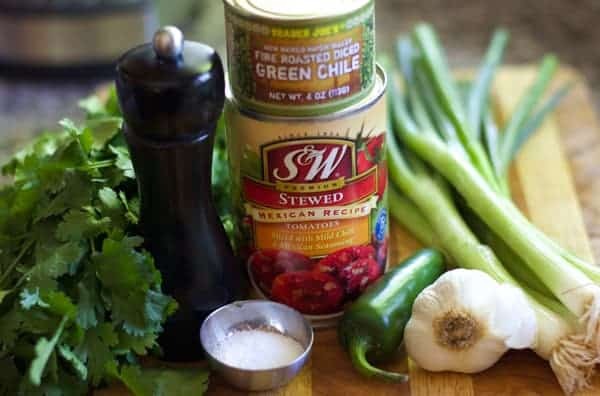 Incidentally, the recipe she’s probably best known for (aside from her Green Chili Turkey) is the easiest recipe of all – this blender salsa. 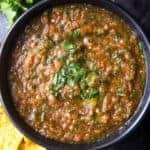 This salsa has been a family favorite since before I was born! There’s a reason it’s still her #1 requested recipe after all these years. 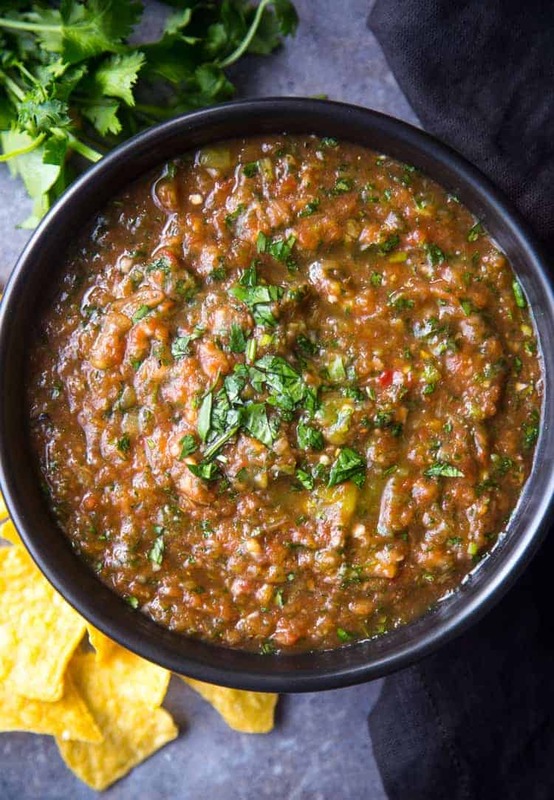 Easy Blender Salsa — The best homemade salsa ever! Mom makes dozens of different types of salsas. The woman can make a homemade salsa out of practically anything! But the one that is requested the most, and also my very favorite, is the easiest salsa recipe of all. And you’ll never guess what the secret ingredient is? Canned stewed tomatoes. Well that, and a generous amount of cilantro. 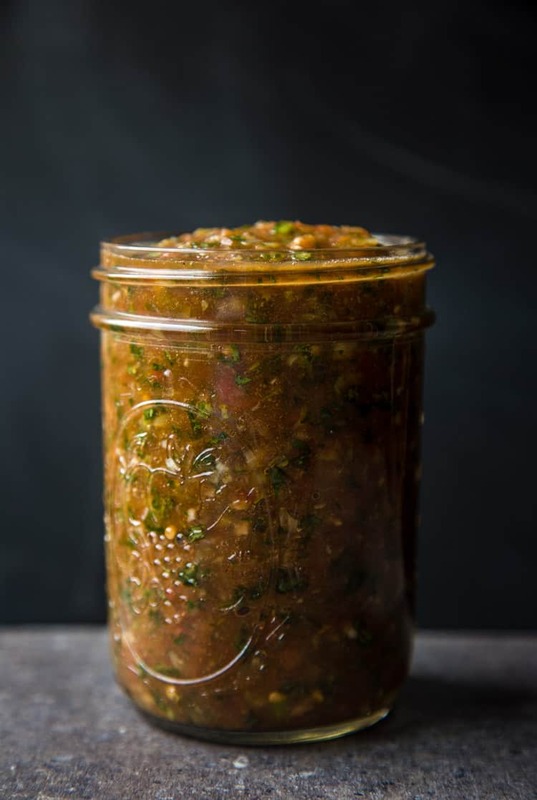 The stewed tomatoes and lots of cilantro give this salsa its signature sweet and herbal flavors and the jalapeño gives it just the right amount of heat. You’ll want to make a double batch because it will go quickly! I’m not kidding. There’s very little chopping involved in this Blender Salsa. I do like to roughly chop/dice the green onions, garlic, and jalapeños. It doesn’t have to be perfect since it will all be blended anyway. Now throw everything in the blender and pulse a few times. Don’t leave the blender on for too long, however. This is not a purée (hence the pre-chop). It’s a salsa, and I like small chunks. Just pulse a couple times to break down the tomatoes and cilantro. Mom’s birthday happens to fall just a couple days shy of Cinco de Mayo. So I thought this recipe may come in handy for anyone out there planning a festive celebration. I’ve got the salsa all ready for my own party! What about you? 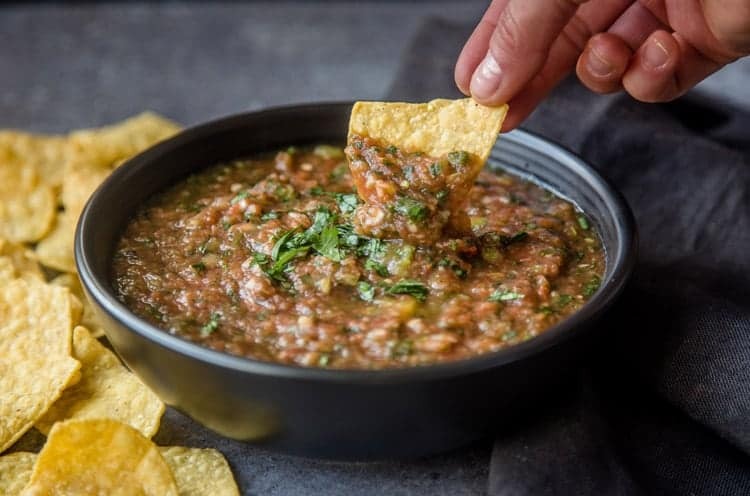 An easy basic homemade salsa made in the blender. This is a family recipe that has been around for decades! 1 15 oz can stewed tomatoes, any flavor will do, I usually select one with Mexican spices or just plain. Try to avoid the “Italian” versions. Add all ingredients into the blender. Pulse just a couple of times. Be very careful not to purée (I didn’t say this was a soup). Pour into your preferred dish and serve with your favorite chips. Nobody will ever know how simple it is. And you can keep the canned tomato thing a secret. Not all jalapeños are created equal! If you don’t like it spicy add half the jalapeño, then give it a taste, and add more later to achieve your desired level of heat. You can also remove the seeds and ribs if you're not a fan of heat. This should eliminate most the heat of the jalapeño. Also, I like to pre-chop the onion, garlic, and jalapeño just to get them started. It makes for less time in the blender. Like I said, it’s not a purée. I still like to see some small chunks. So the pre-chopping makes for less time spent in the blender. Once you make the salsa it will keep for up to at least two weeks in the fridge. One of my favorite things to do when making a large batch is put it in a mason jar and give it to a loved one or neighbor! Combine it with your favorite tortilla chips and a 6-pack of Mexican beer for a great gift! Happy Birthday Mom! I love you! And I love learning your secrets in the kitchen. Keep them coming. Who knew canned stewed tomatoes could do such magical and delicious things? 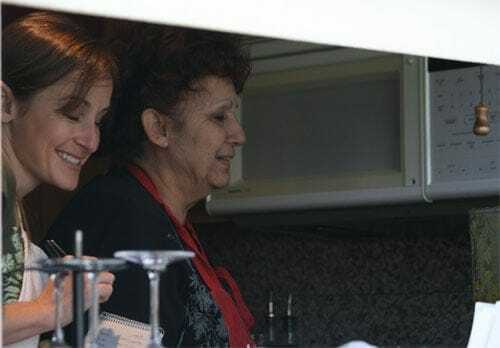 Great recipe and I love the picture of you with your mom! This salsa sounds delicious! I love how easy it is- I definitely need to try it! Thanks, Jay. Yes, it’s super easy and everyone always loves it! Win-win! I LOVE this recipe!! I have made it several times now…since it only lasts 2 days at my house! This recipe is terrific as is..but also to add your own touch. I use the basic recipe but add a couple of good squeezes of lemon or lime and a healthy dash of Tabasco. I have also subbed white onion for the green and thrown in leftover fresh tomato to use up. Delicious every time! I have found it does taste better if chilled for about an hour before serving. ..if you can wait! Thanks for sharing! Will Never Buy Salsa Again!!! I think you brought this salsa the first time I met you. The flavor and the simplicity made it a favorite. We’re having friends over for tacos tomorrow so I’m getting ready to make yet another batch!